Because I have a little more time to relax and have fun this month, I plan to do more cooking as well! I was interested to see what Hatley offered in terms of houseware items and I was impressed to learn that I could get some absolutely adorable aprons, potholders, tea towels and dish sets. 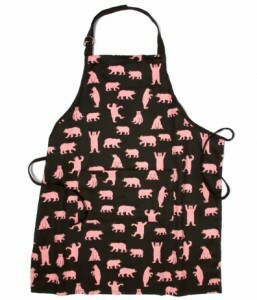 My favourite items on the site were the oven mitts. I must admit I’m not the most coordinated in the kitchen, so oven mitts are a must! I received 2 Dam Great Cook oven mitts to review and they are SO cute! 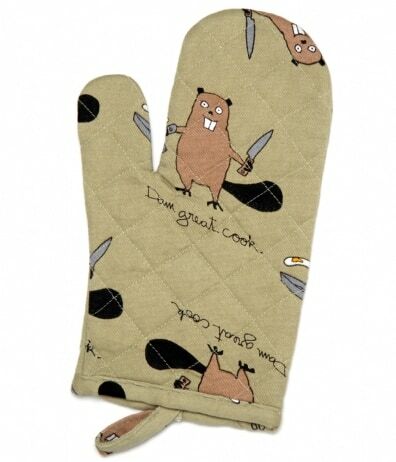 They also suit my sense of humour – the beaver holding a knife makes me giggle every time I use my oven mitts. I was impressed to find that these oven mitts were also really high quality- they are well-padded without being too bulky or stiff! Overall, I’m pleased to say that my love affair with Hatley has continued! My favorite print is the Udderly Delicious. I’m a facebook fan of Hatley under username Jennie Tilson. 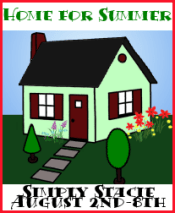 Iâ€™m a facebook fan of Simply Stacie under username Jennie Tilson. My favorite is the Strawberry Picnic pattern. Please enter my name in this nice giveaway – I have re-tweeted it! Thankyou! I’m Following you on Twitter id- Emma__Peel & I Tweeted. I Love the Summer Garden pattern. Please enter my name in this nice giveaway – I have re-tweeted it!